Bartt's ukulele level ONE class. This is an LAUSD Salary Point class. Hooray! You're registering for Bartt's ukulele class. Musicians and non-musicians are welcome at “Ukulele for Teachers,” Bartt’s popular workshop taught at the wonderful Coffee Gallery Backstage, in Altadena. 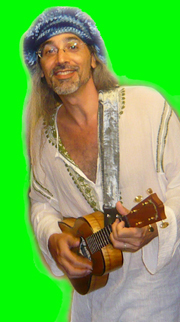 Fun, basic introduction to ukulele, taught by LAUSD Teacher of the Year and acclaimed ukulele virtuoso Bartt Warburton. This is LAUSD’s only authorized ukulele Salary Point class, and it’s geared especially for teachers. The emphasis is on having fun with ukulele. You’ll learn a few songs within minutes. Learn to use ukulele in your lessons, for every grade level and every content area. But mostly, learn to bring more fun into your classroom and your life. The Coffee Gallery has great coffee drinks, yummy food, and comfy tables and chairs. We’ll have the entire concert room to ourselves, and ukuleles can be provided, with prior arrangements. The class fee is $149 and you get one salary point. There will be plenty of food available. Panini sandwiches, chili, salads, fruits, smoothies, and more. Coffee drinks of all kinds, too. It's a cafe and concert hall, so it's set up for food and comfort. We will have a very large private concert room to ourselves, with plenty of cozy tables and comfy chairs, nice lighting, and a relaxing vibe. Bartt provides everything: lessons, beginner chord/song charts, booklets, instruments (with prior arrangements), video lessons, a webpage to share ideas, and lots of loving support. Time to make lesson plans during class, too. If you have never played an instrument, this is your class. If you’re an experienced musician, this is your class. If you’re a teacher, this is your class. If you’re curious about ukulele, this is your class. In other words, this is your class! For more info, e-mail Bartt@Bartt.net. Bartt's LAUSD ART Class - Drawing in COLOR!